An expert aquascaper demonstrates the step-by-step creation of a beautiful 240-L (60-gallon) planted aquarium. Video by Tropica. 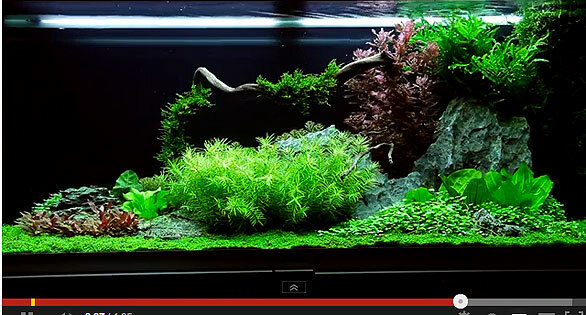 After 55 days, a beautifully planted aquarium demonstrates an aquascaper’s skills. Video by Tropica. Lots of plants for the skilled aquarist. Strong colours and vigorous growth require optimal lighting, as well as the addition of the proper amount of fertilizer and CO2 – But other than that, it is really not that difficult. Hemianthus, Didiplis and Bolbitis all thrive in such good conditions, just as Rotala macrandra and mini-Alternanthera develop optimal, deep-red colours. Credit: Tropica Aquarium Plants, Denmark.